When Ole Miss finally suits someone up in a bear costume, they’ll actually only be the second SEC team to have done so. At least from what I can tell. I could never quite get a make on what I was looking at in this Larry Parker photo from the 1972 Iron Bowl: an actual bear? a line judge suffering from gigantism? someone in a bear costume? But a Google image search has me convinced that 40 years ago, before Big Al, the University of Alabama indeed had someone walking the sidelines in a red jumpsuit and a giant white bear head. It’s not quite as disturbing as the Proto-Gator that appeared in Gainesville around the same time, but it’s still odd to think that a coach could hold such sway in the imagination of a particular fan base as to trump the team’s traditional power-animal identification (in this case the noble elephant). But we’re talking about Alabama fans and Bear Bryant. Anything is possible. UPDATE — 7/5/2011: We found the beast in another one of Parker’s photos, again from the ’72 Iron Bowl. 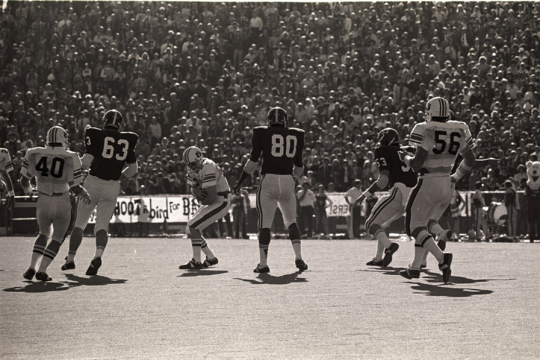 UPDATE — 8/10/2011: Here’s even more photo evidence (including an enhanced closeup) of the existence of the terrifying University of Alabama White Bear that haunted Crimson Tide sidelines in the early 70s, or at least at the 1971 and 1972 Iron Bowls. It’s the crypto-creature gift that keeps on giving. Look closely, click to enlarge. Yeah, uh, the “W”s would seem to detract from your conclusion. I’m guessing it’s a Wisconsin badger, but it could be a Wazzu Cougar. 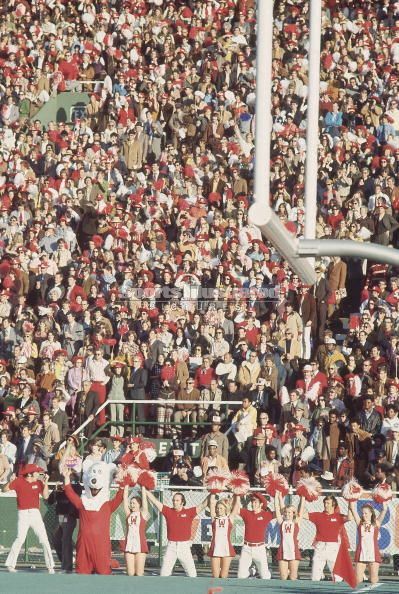 Just not sure what the Wisconsin Badger would be doing at the ’71 or ’72 Iron Bowl. It’s Bama. The “W” is a U&A. Hrm. I was thinking it was maybe just a mislabeled photo. You sure about the U & A? that’s awful close to our logo, can’t imagine they’d use that. Yep b_m, that is a U superimposed over an A. Hmmmm. I wonder where they got the idea for that logo? Red jumpsuit? Those look like long johns to me. Let’s hope the “backdoor” was buttoned up. Beats me why a polar bear would need long johns. Yeah, I’m sure — They used one from the 30s that is disturbingly even closer. 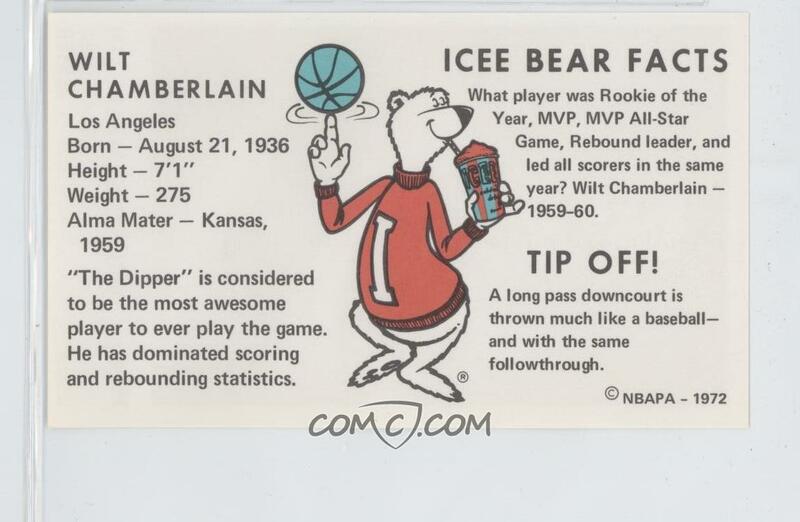 I’m guessing its because of that guy that coached there that they called the bear, at least I think that’s what they called him. And of course it’s a white bear, I don’t think Bryant would approve of a black bear. Here’s another shot of that bear in basketball mode. 1. Definitely an Alabama logo. The difference is that they combined the bottom of the “U” with the crossbar of the “A,” kind of like the UnderArmor logo, while we include both in our “AU” logo. 3. Funniest thing about “Big Al,” aside from his oversized-rat appearance, is that Bama refused to consider having an costumed elephant mascot for years, and made fun of Aubie, until Aubie became a big hit. Then they went out and created Big Al. Well, at least they didn’t resort to everyoby wearing some sort of black and white stupid ghey-lookng houndstooth pattern!! The guy next to the bear looks like he’s going to punch him in the nose which is probably not a good idea. The man within the head is one huge dude. If you had the best coach in college football history with an animal nickname, heck yeah you’d stick a Bear hat on someone. Dude, check out all the red cowboy hats. There exists a picture of me as a toddler wearing a red cowboy hat with an A on it (taken around 1975ish). Though it would appear to be a clear case of child abuse, my parents are Bama fans, so I guess it’s legal in Birmingham. The games weren’t over back then until the “Bahr” pinned the bear. Kind of like a bizarro, redneck Festivus. The W turned UA thing is interesting. That would also explain seeing it scratched in cement in the shadows of Bryant-Denny recently. Now I know how old that sidewalk is. Supposedly, there was an attempt to create a “Tide” themed mascot. It was a guy dressed up to be Poseidon or something carrying a Trident. I think that was in the 60’s/70’s. —-Are you guys just now seeing this logo? It’s very similar to your current logo, indeed, and long after we disposed of it for the script “A”, is when you guys inherited it. —-Because, moron, the elephant is Alabama’s mascot, and Crimson Tide is its athletics name. Like Miami, they’re the Hurricanes, yet their mascot is a duck. And Tar Heels… their mascot is a ram…. but congratulations on being original by having two different mascots, and 1,000 name-changes for your university. —-Is it similar to the way you guys recycled our old garbage logo (as seen in the image above)? ………………….., When did “ya’ll” start your UA interlocking logo? Ours was added to our helmets in about 1965. This picture is from 1972. And yes, your old logo IS garbage…. it’s like a kindergarten child would draw…. doesn’t anyone in the art department in t-town have any talent?? And if we DID happen to recycle your logo, it’s the FIRST thing Auburn EVER took from bammer. It’s ALWAYS the other way around… copying us by naming the stadium after your present head coach, copying us by getting a mascot, copying the Tiger Walk, copying the GAF, etc. 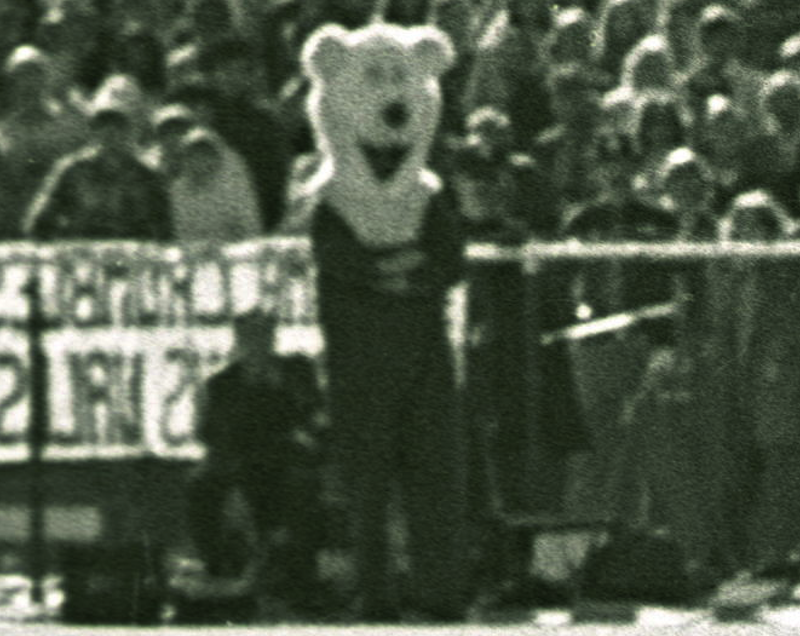 Pardon me, but that is Auburn’s “Shug the Bear” mascot, which was introduced during the televised Iron Bowl in 1969. Named in honor of Coach Shug Jordan, the mascot implied a future trip to the Sugar Bowl and a chance to play Nebraska for the national championship. It was one of the most publicized Iron Bowls in history, and Shug the Bear was created to fulfil the spectacle of that environment. After the song “Dixie” was played before the game began, Shug made his way onto the Auburn sideline, where he led cheers from spectators in the stands. Oops! I meant to say 1964 IRON BOWL: Shug the bear is mentioned in the 4th paragraph. 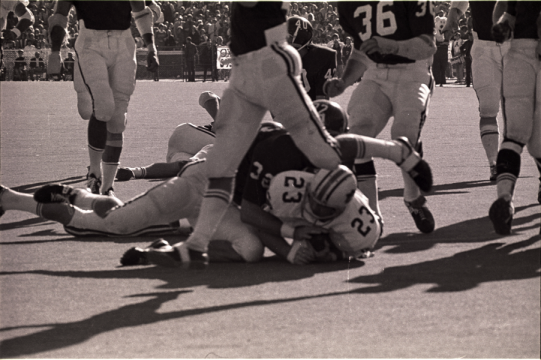 Television also began developing an interest in the Alabama-Auburn rivalry and first beamed the classic rivalry to the rest of the nation on Nov. 26, 1964. Coach Jordan’s Tigers came into the game with a 6-3 record and with consecutive wins over Mississippi State and Georgia. Bryant’s Crimson Tide, led by Joe Willie Namath, was undefeated (9-0) and, in fact, had not lost since Auburn upset the Tide 10-8 in the Iron Bowl the year before. Legion Field was absolutely electric with excitement. Thousands roamed the stadium outside hoping somehow to get into the game and apparently ignoring the fact that it was on national television. Of course, the tickets were split for the game with half of the throng of 68,000 screaming for the Tide and the other half for the Tigers. The two bands went through the pregame ritual of coming onto the field together, playing the fight song for each school, the alma mater for each school and then combining to play the national anthem. On this day the tension became almost unbearable by the time the final strains of “The Star Spangled Banner” had floated across the stadium and it was as if the world stood still for this football game. For the first time a national TV audience observed the Alabama backyard brawl and it had all the ingredients to keep fans interested. 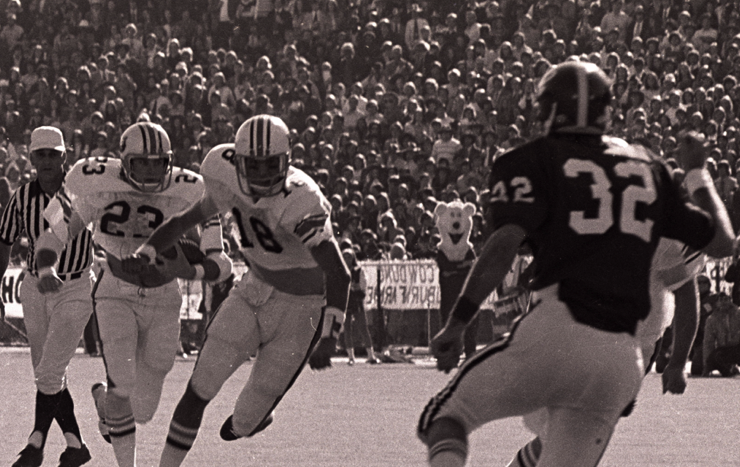 With SHUG THE BEAR on the sidelines, bowl representatives in the press box and pride at stake, it was war. The two teams battled back and forth with both sides giving their all. All-America fullback Tucker Frederickson could not be stopped by the tough Tide defense but the Tigers could not contain Namath. Alabama finally won, 21-14. Fans were absolutely exhausted and drained from the tension and, for the first time, the rest of college football had a better idea of what the Iron Bowl was all about. The Tide won the national championship and went on to the Orange Bowl where Texas upset Bama, 21-17. ………….. last time i checked miami’s masoct was an ibis. not a duck. but then again, you’re then one posting an an Auburn blog at 3:37 in the morning, so you obviously have more time on your hands than i do. anyways, thanks for the explanation of the elephant being your mascot and “crimson tide” being the name of the athletics teams. makes much more sense than Auburn having a tiger as a mascot and our athletics teams being called the tigers. wait…….. The Shug the Bear mascot was implemented to highlight the battle between two great coaches – Shug Jordan and Bear Bryant. I retract what I said about it being an Auburn mascot, although I always thought it was. I think it was created for the television audience to enjoy during the coaches’ years at the Iron Bowl. and the 1969 Iron Bowl was not televised…. 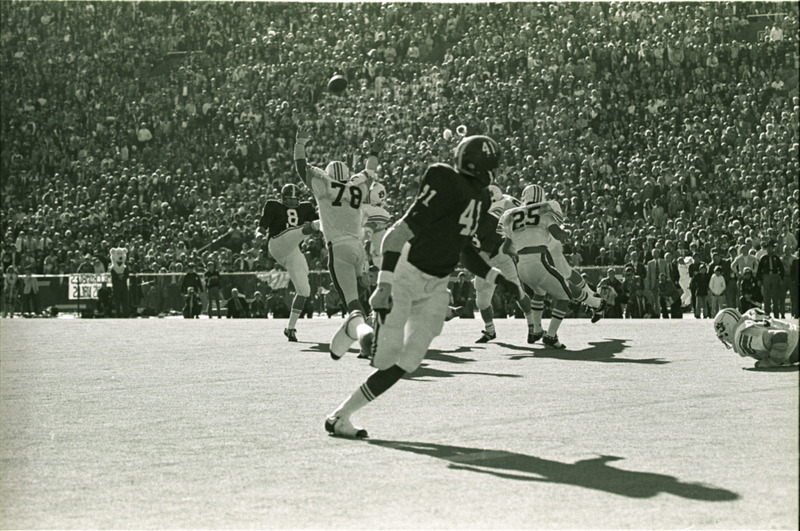 after the 1964 TV game, the next time it was televised was in 1971 – then in 1974 – (contrary to popular belief by many, the 1972 Punt bammer Punt game was not televised) – 1981 began the string of MANY Iron Bowls in a row for television – matter of fact, the only time it hasn’t been on since then was the probation/undefeated year of 1993. That doesn’t say “Shug the Bear”. It says “Shug and Bear on the sidelines”.